"If your paraphrase contains more than 2 or 3 consecutive words from the original that are not enclosed in quotation marks, or uses the same syntax", you have plagiarised. What is an acceptable paraphrase? 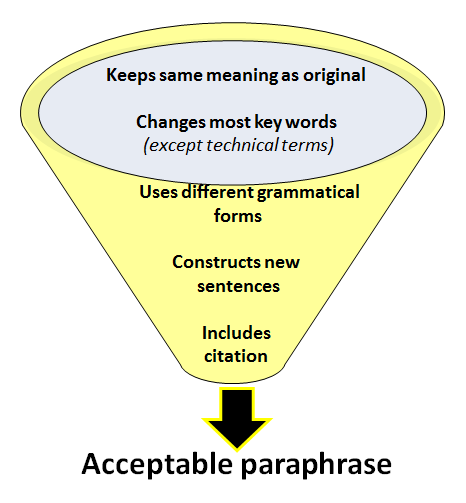 An acceptable paraphrase that meets all the criteria on the left is one that uses a combination of strategies to report the meaning of the original text. Step 1: Understand what you are reading. This may involve checking the meaning of some terms, and identifying the main point(s) of the text. Step 2: Make notes, preferably without looking at the original. It is also useful to think of possible synonyms that could replace the key words (except technical terms). Making notes is an effective paraphrasing strategy because you will be forced to find the key words that represent the main ideas and not be tempted to copy whole sentences. Start from the main idea rather than from the first sentence in the original text.This ensures that your reconstruction will look different structurally. Step 3: Reconstruct the text by putting the notes you have made into your own sentences and words.